I came across this recipe in one of the many cookery books I inherited from my mother - ‘Economical Cookery with Australian Fruit, Honey and Butter’. Printed just after the war, and costing 6d, the aim being ‘buy from your own folks in Australia to enable them to buy more from Britain’. 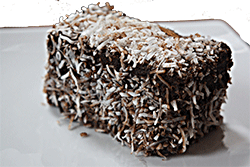 The earliest known published Lamingtons recipe for this national cake appeared in the Queenslander newspaper in 1902. There appears to be some disagreement as to how it got the name of Lamington. One story is that it resembled the hat always worn by Baron Lamington, governor of Queensland from 1896-1901. Other stories say that it was named after Lamington village in Scotland, Leamington Spa or Lemmington in Northumberland. Reference has been found to Leamington cake in Victorian cookbooks, so the lamington could have developed from these. I understand there is some dispute with New Zealand about origins as they also claim it as their own. I’m not getting involved in any arguments between Australia and New Zealand! Preheat oven to 190°C/375°F/Gas mark 5. Grease and flour a 13” x 9” (22cm x 30cm) x 2” (5cm) deep rectangular baking tin. In a large bowl, cream together the butter, sugar and vanilla until light and fluffy. Add the eggs one at a time, beating well with each addition. Add the flour mixture alternately with the milk; beat well. To make the icing: In a large bowl, combine icing sugar and cocoa. In a saucepan, heat milk and 1 tablespoon butter until the butter is melted. Add the milk to the sugar mixture and mix well to create a fluid, but not too runny, icing. Cut the cake into 24 squares. Place coconut in a shallow container. Using a fork, dip each square into the icing, then roll it in the coconut. Place onto a cooling rack to dry. Continue for each piece. The icing will drip, so place a sheet of greaseproof paper under the rack to catch the drips. I know that the printed Parish Newsletter goes to at least two people in the antipodes and I am sure they will let me know if I have got anything wrong!